A daytime basement café in Russell Square. Really nice place. Staff is very friendly, interior is cosy and warm. Food is fresh and tasty. The prices are also very friendly ! We loved it and we'll come back here. Tucked away on a quiet street down some steps, you would be forgiven for walking straight past Bloomsbury Coffee House but that would be an error. This calm and cosy little venue is a great place to while away some time with a good book or your laptop. The staff are friendly and unassuming, the coffee is smooth and the food delicious. I had a really tasty toasted wrap jam-packed with avocado, halloumi, tahini and plenty of salad and pricing wise it certainly competes with the likes of Pret et al. The difference being I’d quite happily sit here all afternoon listening to their chilled music vibe and catching up with friends. Great coffee, lovely setup and just out of the way enough to be a sort of hidden gem. The only problem is that on Saturdays they ought to be open longer! It's one of the only places I would recommend going to for coffee in the Russell Square area, and it's perfect for doing work on university days, and the baristas are really nice. It's lovely to sit near the window and people watch, and the lighting is nice and bright, a real sense of neighbourliness and cheer in the air. Will make it a point to try their cinammon buns next time since everyone here seems to be raving about them! I'm just here for the cinnamon buns. A quaint little cafe in one of my favourite parts of London, selling all manner of sugary pick me ups that are especially appreciated on a rainy work day. Russell square is a medics dream, with the British Medical Association being just down the road and Great Ormand Street children's hospital being similarly close. The hospital's tribute to Peter Pan is located just outside the main entrance, as all royalties from this go towards life saving treatment. Have a wander around the area after a very British tea of Earl Grey and Treacle cake and you will find yourself learning far more about our Institutions and history than you bargained for. Came here when meeting a friend near Euston. Cosy little cafe with plenty of food choices to keep meat lovers to vegans happy. Reasonable prices to boot-- whats not to love?? I love this little cafe so so much. The food is prepared with real love and is absolutely delicious. I also think it serves one of the best 'flat whites' in London. The coffee smells and tastes wonderful; the food varied and delicious. A unique place to frequent; Also some cultural events are hosted there to enjoy and engage in. Delicious home made and very friendly owners and staff. So original, fabulous menu which changes daily, lovely friendly staff and a hidden gem in London town. A very pleasant place not far from the British Library, with proper chairs instead of stools or benches. Lots of seating for your free wifi use. Good coffee, brilliant cakes under £5 and free wifi... Nice and quiet in a rather busy area. Wonderful and really friendly service. Wish the opening hours were longer! Gorgeous cakes and coffee complemented by great background music. Delighted with this place. Shame the opening hours are so short on a Saturday though. 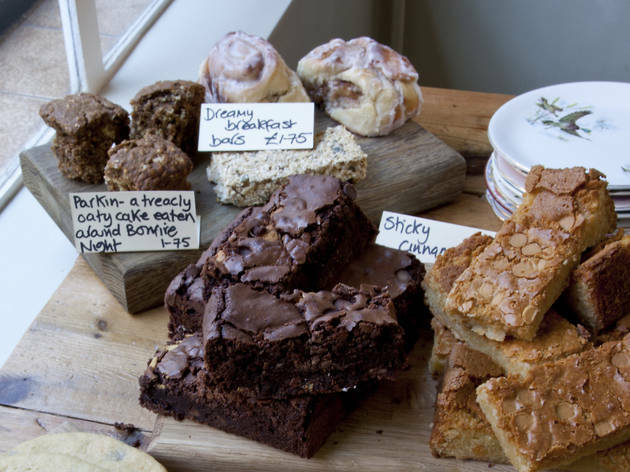 Hidden gem in Russell Square with a small but perfectly formed menu of hearty mains and scrumptious homemade treats. I had a flavoursome minestrone soup that was packed full of juicy vegetables followed by an iced cinnamon bun that was so fresh it was still warm - all washed down nicely with a couple of teas from their wide range (the chilli chai tea was especially delicious). 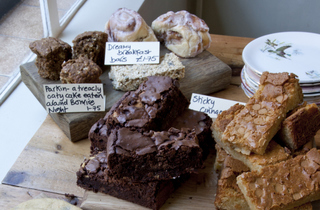 A cosy coffee house perfect for escaping the hustle of London - top marks! Really friendly coffee shop that has amazing home made food and coffee. I absolutely love the honey buns! Highly recommended, a must visit when in Russell square or close by.